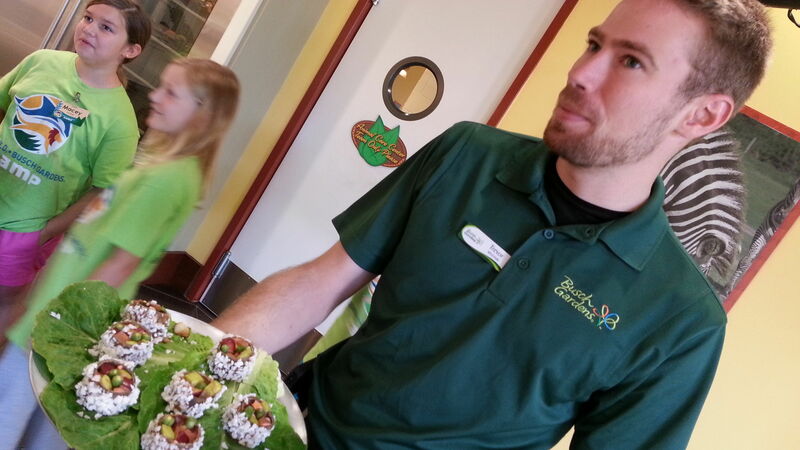 Busch Gardens campers prepare a healthy "sushi" to be fed to the tigers. 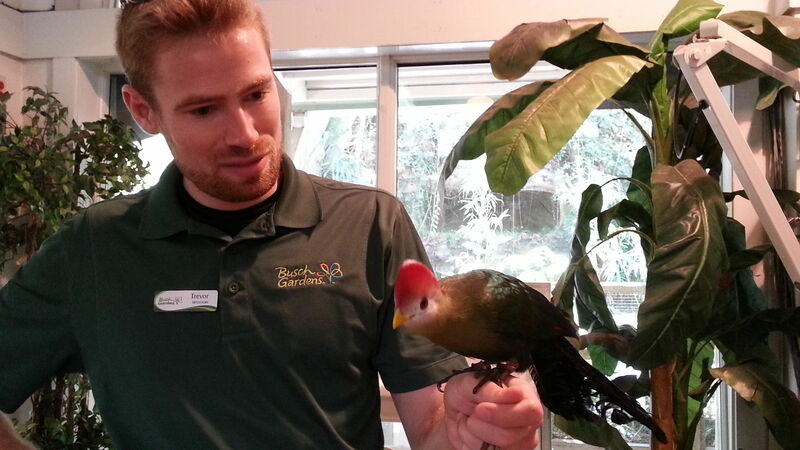 Busch Gardens staff is on hand to help park visitors interact with animals and birds. 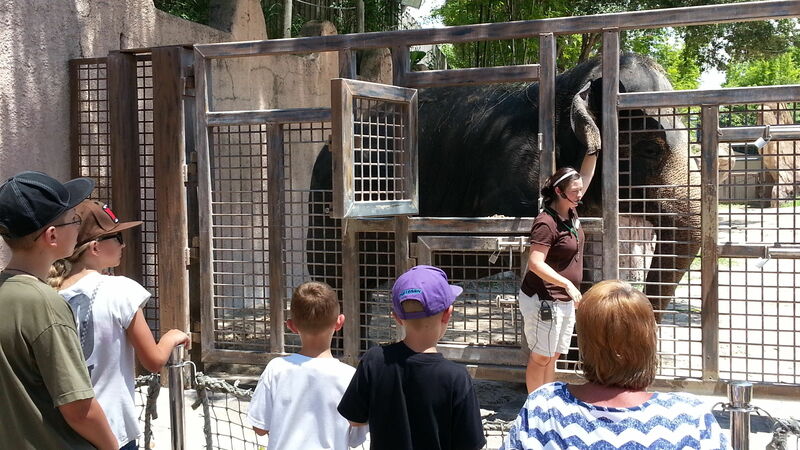 The Elephant Wall at Busch Gardens Tampa is where daily interactions are held. 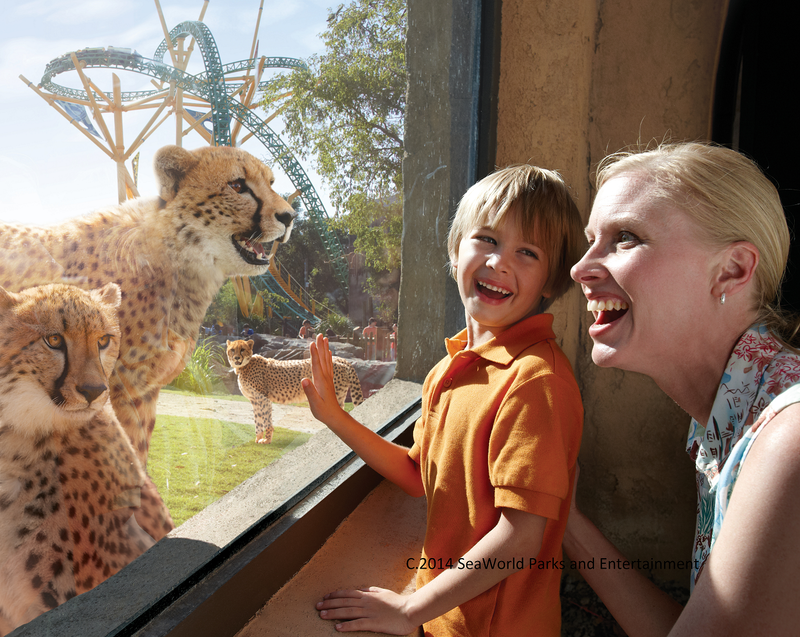 Cheetah Run, where families get close to these fascinating, fast felines. The Busch Gardens Tampa themepark has expanded its animal offerings in a thrilling effort to bring Africa to life for visitors. And, maybe because we’re reading Elephant Company at bed time, but of the 12,000 animals in residence, we fell hardest for the elephants. Imagine watching a Bengal tiger lying on an operating table – limbs akimbo — getting his annual wellness exam, and you understand the magic of the new Animal Care facility in central Florida. Long a popular destination for its African themed thrill rides, coasters and shows, this amusement park considers taking care of 307 species to be serious business. The 16,000-square-foot, state-of-the-art Animal Care Center comprises an exam room, an operating theater and a lab behind glass walls that allow park-goers to watch (in close up on a flat screen TV) exactly how African wildlife is cared for. From nutrition to treatments, X-rays to surgeries, it all happens here. We see photos of a sandbill crane having a pin implanted in a broken wing. Coral, a limping flamingo, has a printed medical chart we can insert into a QR code reader -– here or at home — to diagnose her malady. Busch Gardens, a division of SeaWorld, is at the forefront of a thrilling evolution in theme parks and zoos, as visitors of all ages long to get involved, to move beyond being spectators and go behind-the-scenes. Some initiatives predate the controversial documentary about keeping orcas in captivity, Blackfish, and extend to the Blue World Project announced in August 2014. This research facility will open at SeaWorld San Diego in 2018, with a new, 10-million gallon tank, enlarged viewing areas, $10 million in research funds, and more programming between scientists and visitors to foster a deeper appreciation of killer whales. After its premier in California, it will be added to the parks in Orlando, Florida and San Antonio, Texas. From the Animal Care Center Lab, we move into a test kitchen filled with campers preparing lemur snacks under the watchful eye of young gamekeepers. The tigers’ ground meat “sushi,” made inside paper towel rolls covered in peanut butter and rolled in coconut, looks particularly delicious. A crowd has formed in the Animal Care Center waiting to watch a gibbon get a vaccination. Granddads and toddlers will be able to ask questions and hear the vets at work. They can study any needed blood samples through a video feed from the lab’s microscopes. Nutrition demonstrations, on the other hand, take place during scheduled times each day and entry is always free to the facility. Budding veterinarians and human doctors would probably be fascinated by the behind-the-scenes guided tour for an additional fee. Doing for wildlife what sister park SeaWorld does for marinelife, Busch Gardens Tampa also has animal interactions. These are much more zoo-like than what’s available at Disney’s Animal Kingdom about an hour away. The Busch Gardens Tampa Serengeti Safari ($29) is a fun 30-minute bounce-along in the back of an open truck — at the perfect height to feed lettuce to giraffes relaxing out in the savannah. Over at the fenced-in corral called the Elephant Wall, a pachyderm not being spritzed by the zoo staff is being asked to show us her ear. The zookeeper explains that vets request this behavior so they can draw blood from the many large veins in the huge ear lobe. In a playful mood, the elephant swings her rear (instead of her ear) over the wall, waving at the crowd with her tail, to much delight. Nearby, there’s only a short line for Cheetah Hunt, the triple launch coaster and the park’s longest ride, located next to the cheetah habitat. We skip the ride and go looking for other thrills, hoping to make new friends among the sleek cats. Here’s a quick look at some of the park’s innovative wildlife programs, in a short video. If your kids love to see how things work and get behind-the-scenes wherever they are, don’t stop the learning when you leave the park. Generation Nature (GenN) is an online platform the park uses to provide environmentally responsible activities, games and learning programs to students under 17 and younger children. You’ll find a website, apps, videos, online games and more, highlighting new animals each month. Kids can upload photos of their pets, study animal behavior and participate in monthly challenges on the route to becoming an Environmental Excellence Award winner. For an interesting place to sleep and eat, try the unusual Epicurean Hotel that celebrates the culinary arts in many forms. Guests can dine at Elevage where dishes range from BBQ Gulf Oysters to excellent steaks. Elevage greets diners with two “live walls” in the foyer growing lettuces, herbs and tomatoes used in a delicious house salad. The unusual menu and casual style of the place will appeal to kids, especially at lunch hour. Regular cooking classes and wine tastings are held at the Epicurean Theatre, a beautiful classroom with arena seating for up to 50 where everyone has a great view of the chefs at work. If you get lucky, you may even learn secret recipes from Bern’s Steakhouse, one of Tampa’s most famous eateries. Since the 1950s, they have used locally grown produce and ingredients – many raised at their own farm — to serve sustainable, farm to table cuisine in a romantic, upscale setting. Whether you have their lobster, a steak or Caesar salad, save room for one of their chocolate desserts served in the special dessert parlor. Here are reviews of other Tampa accommodations that welcome families with kids. Visit Busch Gardens Tampa for more information on the park and its Animal Care Center; if you’ve got older adventurers with you, checkout this Busch Gardens Blog for reviews of the park’s top thrill rides.